*Real Sneakas* | TOKEN DREAD GIRL! I used to be totally in love with sneakers when I was younger, but as I got older I began to appreciate the yearning for a fresh pair of heels. And so I dropped sneakers for what I thought would be eternity. 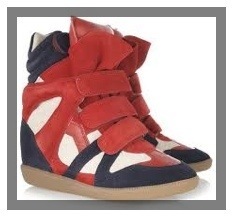 These Isabel Marant Sneakers are to die for. They feature a hidden heel and our Queen Bey even Sported a black pair in her Love on Top Video. However i’d die for this British infused color bomb. Since i’ve always loved the Brits passionately. Lol. I’d sure have a jolly old time wearing these. While expressing my love for these sneakas to my Dear Bill. He sent me these lovely gold Margiela Mirror Sneaks and I fell in love all over again. It seems like I’m falling back into my good old Sole saving ways. Hmmmm. Eff a pair of Jordans. Id save these two soles anyday! Wow what different looking Trainers (Sneakers as you say in the USA). I like them though. Especially the Gold Pair. They really are amazing. O ‘trainers’ i learnt something new. Thanks!